a main advantage for the region. New York City is probably the most important wine market in the world, and if local wines can 'get in' there, they should be on the road to easy street on the world stage, right? Well, it's a nice theory. Unfortunately, only a handful of producers have been able to infiltrate New York City restaurants lists -- places like Channing Daughters Winery, Paumanok Vineyards, Lieb Cellars and Bedell Cellars (not a comprehensive list by any means). There hasn't been a concerted, or at least effective, effort on the part of the region as a whole to market its wines in New York City. As such, the average New Yorker doesn't think much of Long Island wines. They've probably only tasted one or two low-end wines from one of the larger producers. New Yorkers can be a judgmental lot, so they are more than willing to write off an entire region based on one or two bottles of plonk. Is that a bit like judging all of California wine based on Sutter Home White Zinfandel? Maybe, but in a city filled with endless wine options, New Yorkers can afford to be particular. There are always different (and often cheaper) wines they can try. But, I think if Long Island wineries can get their better and best wines, many of which are in fact values) in front of more New Yorkers, they can start to turn the regions NYC reputation around. And $200,000 that New York State Senator Kenneth P. LaValle assigned to the 2008-2009 New York State budget specifically allocated for marketing Long Island wines in New York City should help... if they use it well. I haven't heard any specifics about what programs they plan to invest the money in, but the grant will be administered by the New York Wine & Grape Foundation and will focus on four ideas outlined by the Long Island Wine Council: awareness building, media outreach, restaurant outreach/direct marketing, and marketing analysis and education. The goal of this initiative and the focus of the strategies are to generate wholesale opportunities in restaurants and retail stores in the New York City market. Ideally, the project will not only result in new sales over the course of the (one year) initiative, but will also lay the groundwork for sustained, longer-term interest and demand on the basis of a new understanding of the quality and consistency of our region's products, as well as new relationships formed between wineries and sales targets. I, for one, will be watching this closely to see what programs and strategies the region comes up with. This would seem to be well timed considering the continuing "local" movement. Maybe this will be a perfect storm of funding, programing and audience. Maybe it will be another costly flop of a tax-supported program. With so many wineries involved, with so many strong personalities (both in good and bad ways) the LIWC and NYWGF will have their hands full trying to focus members on common goals. A press conference is scheduled for Friday at Paumanok Vineyards. Unfortunately, I can't attend. If anyone is going and wants to offer a report, shoot me an email. Today is the day for the third edition of Wine Book Club, and hey, I'm hosting! 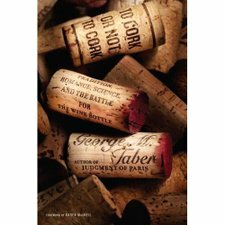 The book I selected is George Taber's To Cork or Not To Cork: Tradition, Romance, Science, and the Battle for the Wine Bottle. As I said when I announced the book, the whole cork/Stelvin/Zork topic is one that I've found myself getting more and more interested in, so this was a book I really wanted to read. And I still do... and will. What do I mean? Well, I'm apparently not a great host. I only made it about half way through the book. I could list any number of excuses reasons, but I won't. It doesn't matter. I just didn't finish it. But I have read enough of it to know that I'm enjoying it and that I really will finish it eventually. So what can I tell you about it? Well first, it's not your typical wine book. I don't think that any casual wine drinker will get through even the first chapter. It's a book that is not a quick read. It's heavy on the history and will teach you more about wine closures that you probably ever wanted to know. And yet, for a geek like myself, I'm that's very cool. I'm not normally big into reading historical narratives, but because I'm so into wine, I'm enjoying it. I do wish that I had finished it in time to write about it. The section I'm reading now is about some of the composite and other natural cork alternatives. In some ways, their stories read like the swell and bursting of the Internet bubble of the 90s. Would many of my wine-loving friends enjoy this book? Probably not. But, someone like my father, who is a retired science teacher and a history buff, would love this book. In fact, he's going to get my copy when I'm done with it. Thanks, Dr. Debs for letting me host...even if I didn't quite fulfill my duties. This review is going to be a quick one. 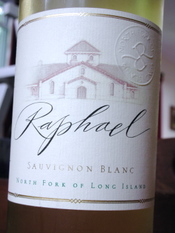 I've enjoyed Raphael's sauvignon blanc for several years. 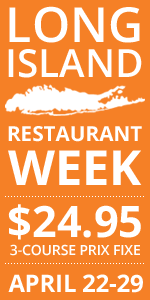 It always seems to capture Long Island style (or terroir if you prefer) -- straddling the line between Old World and New World. It typically has the minerally character you'd expect from a Loire Valley rendition and some, but not all, of the intensely grassy components that make New Zealand sauvignons so unique. So how does the 2007 release stack up? Pretty well. The nose is classic sauvignon blanc — bright grapefruit, lemon, kiwi and lemongrass aromas. The palate, which is on the full side of medium bodied, is zesty and refreshing with loads of grapefuit, kiwi and mineral flavors and lively acidity. The finish is a little light and short, but this wine still serves as proof that sauvignon blanc is the white wine future of Long Island. I'm proud of every wine that I choose for the New York Cork Club, but this month's selections are wines that I'm particularly excited about. One is hard to get (we couldn't get any last year) and one is one of the best sauvignon blancs to come out of New York. First up is the wine that can be difficult to get if you're not a member of Paumanok Vineyards' wine club -- their 2007 Chenin Blanc ($27). it's a delicious and unique-to-the-state white that has been praised by writers like Eric Asimov of the New York Times. And, it's one of the first Long Island wines bottled under a Stelvin (screwcap) closure. Chenin blanc is rare on the North Fork — no one else grows it actually. They don't make much and it has a rabid following. I think we got lucky to get enough for the club this year. flavors, but as the wine crosses over into the mid-palate, the flavors change a bit, becoming richer with pineapple and honey overtones. That honeyed fruit character carries through to the finish, which is long and delicious. The texture of this wine is faintly oily but it remains lively and clean because there's plenty of balancing acidity. Our second wine, Macari Vineyards' 2007 Katherine's Field Sauvignon Blanc ($22) is one of the best sauvignons to come out of this region. It pours an extremely pale greenish-yellow in the glass and offers intense aromas of grapefruit, lemon and lime zest with understated hints of just-cut grass and crushed Thai basil leaves. The palate is mouthwateringly crisp and similarly citrusy, with fresh grapefruit and sweet lime flavors accented by a seawater minerality and more of that grassy-herbal character... but not too much. 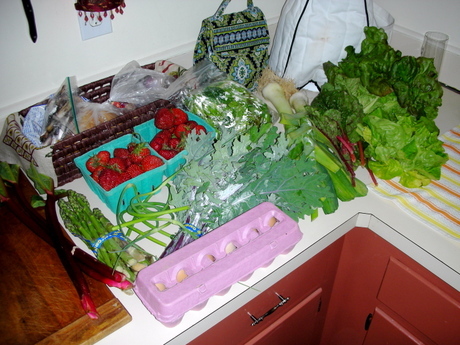 I'm a week late (and forgot to take a picture of this week's share) but I wanted to post about our CSA share at Garden of Eve Organic Farm out on the North Fork. From left to right (more or less): rhubarb, asparagus, strawberries, garlic scapes, eggs, Russian kale, mesclun, leeks, Swiss chard, red leaf lettuce and green leaf lettuce. Lots of salads this time of year, but Nena also made some killer shortcakes to accompany some of the strawberries we got this week. Amazing how different locally grown strawberries are from the hard, flavorless berries at the grocery store, isn't it? Pinot grigio isn't a grape that you hear much about on Long Island. There isn't much of it grown and only two wineries bottle it varietally -- Channing Daughters Winery and Martha Clara Vineyards. In the past, I've found MCV's to be pretty bland, boring and flat on the palate. But, the 2007 bottling, winemaker Juan Eduardo Micieli-Martinez's first with the winery, shows promise and balance, bringing much more to the table than your average cheap grigio from Italy. On the nose, all of that classic citrus character is here -- coming through mainly as grapefruit, lemon and lemon zest aromas -- but what sets this apart from the boring lemon-water Pinot Grigios that line wine shop shelves is a subtle richness and faintly herbal, faintly almondy note. Similar flavors come through on the palate. My notes say "fresh-squeezed lemon, lime zest, sweet grapefruit" and the acidity is terrific. I did notice that when ice cold, there is a bit of a sour, bitter citrus pith (the white part between the zest and the pulp) flavor. Letting it warm a bit helps. I've tasted this wine a few times since it's release and it keeps improving. In fact, Juan thinks it will be tasted great by the time Labor Day rolls around. But, it's been selling briskly and may be sold out by then. It's good right out of the fridge, let it warm just a bit so that you don't miss on some of the secondary flavors. It doesn't affect the juice inside, but I like the new, fun phonetic label on this one too. Look for it on some other whites in the future...and for screw caps. Found via Pinotblogger and reminded to post it by my friends at Martha Clara Vineyards. I'm Home. And Catching Up. Sorry for the lack of blog activity while I was in the Windy City for work. It's not that I wasn't eating or drinking anything interesting. I was. But with spotty WiFi and without being able to dump pictures from my camera onto my work laptop, blogging just wasn't in the cars. But, I'm home now and hope to catch up this weekend. So look for some notes on my stay in Chicago, some Long Island wines I tasted just before I left and also some interesting goings on in the New York wine world. At the end of May, the Seneca Lake Wine Trail hosted the 3rd Annual Golden Nose Awards in Corning, my home town. 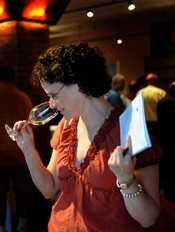 The Golden Nose is a wine- tasting and judging event that utilizes the noses of the participants, who are trained and led by experts to make judgments about wine. The event was held at the Rockwell Museum of Western Art and the Corning Museum of Glass, two amazing venues that I would highly recommend for a visit any time you happen to be in the Finger Lakes/Corning area. Our friend the Finger Lakes Weekend Wino was a participant and therefore a judge, and he writes about his experiences here. The official website of the event, outlining the itinerary and results, can be found here. The Golden Nose Awards is a great way to get more people involved with wine at a level at which they might not otherwise find themselves engaged, and therefore I cannot help but applaud the idea. After all, the ultimate critics are the consumers and there is no reason to assume that most consumers are incapable of learning how to judge wine in a sound and legitimate fashion. At the very least, I would imagine that the enthusiastic wine drinker does not bring the same amount of hubris and snobbery to an amateur tasting event as would many professional critics. Of course, I am fully aware that it takes many years to learn how to differentiate between the subtleties and nuances found in wine, and in my own experience I believe that my palate is nowhere near ideal after several years of trying to bend it into shape. As much as a professional can help guide a random group to a better tasting in a brief and intense session, the fact remains that some of the amateur judges simply weren't going to rise to the occasion no matter what. As long as they had fun, however, who cares? I do not look at the Golden Nose as a comprehensive Finger Lakes wine tasting event at this point, hoewver. According to the list of wineries, it looks as if some very good to excellent wineries did not participate. Additionally, the matter of sponsorship means that Seneca Lake is overrepresented while the offerings from Keuka Lake and Cayuga are a bit sparse. Ironically, these deficiencies are no more glaring than those of other New York competitions that are professionally judged and make the bold claim of being more comprehensive, such as the always controversial Classic. The Golden Nose Awards is about consumer participation, and it succeeds marvelously in this respect. Next year, I will make sure to try to coincide a trip to see my family in Corning with the Golden Nose. 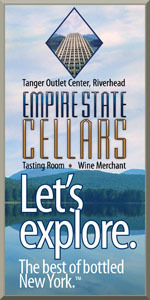 It sounds like a good time and a wonderful chance to meet some fellow fans of Finger Lakes wine. 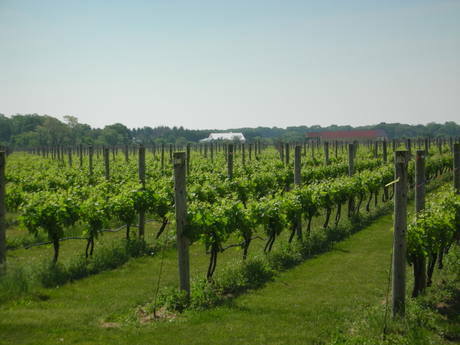 Pindar Vineyards, Long Island's largest winery, has hired a new winemaker, Les Howard, most recently of Jamesport Vineyards. Les, a Long Island native, started his winemaking career at Pindar almost 15 years ago when he had a summer job on the bottling line. Now he's back, as head winemaker. 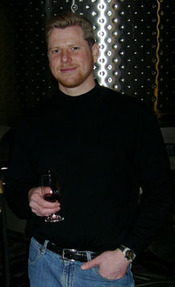 He made a lot of delicious wines at Jamesport, and many more will be released after he's gone. He's also a great guy who I've enjoyed talking with over the years. There are going to be many challenges moving from a winery like Jamesport to one like Pindar, challenges beyond the 7,00-case to 70,000-case production levels. But, if Les is given the freedom to make the wines that he wants to make, we can expect a sharp increase in the quality of wines coming out of Pindar's winery, which would be a very good thing. I haven't heard what Jamesport plans to do on the winemaking front, but the parting was apparently amicable. 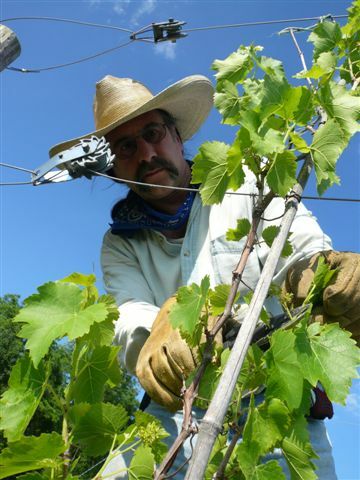 Maybe Ron Goerler Jr., the owner, will take the winemaking reins back again? Anyway, congratulations, Les. I look forward to tasting your first Pindar wines a year from now. Today is Wine Blogging Wednesday, hosted by Dr. Debs of Good Wine Under $20, a blog that has received quite a bit of acclaim over the past year or so. The theme she chose proved to be a bit of a challenge for the guy who tries to drink as much local wine as he can -- particularly for WBW. You see, she wanted participants to drink a wine made from the white varieties of the Rhone Valley in France... things like Marsanne, Roussane and Viognier. 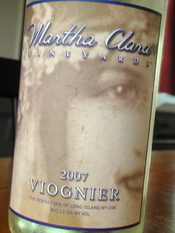 New York is a bit cool, generally, for those grapes, but one North Fork Producer does make a viognier, that being Martha Clara Vineyards. So, I was able to drink local this time around, and enjoy one of the first releases from MCV's new winemaker Juan Eduardo Micieli-Martinez, formerly of Pellegrini Vineyards and Shinn Estate. The nose is expressive, but not overly so, showing nice peach aromas with honeysuckle and some just-barely-ripe honeydew melon as well. The palate, which is medium bodied and features a bit more acid than most Viognier I've tasted, offers straight forward peach/nectarine flavors with a lemon zest note on the end of a medium-long finish. It doesn't have much of the oily, glycerin mouthfeel I've found in many of the Viogniers I've tasted, but with so much acidity in its youth, one wonders if it will reveal itself with another year or two in bottle. Overall, there is a focus and a cleanliness to this wine that hasn't been present in previous vintages of this wine. That gives me hope for the future of the winery under Juan's watch. I know that I sound like a broken record, but the more North Fork sauvignon blanc that I taste, the more I'm convinced that wineries should (will?) rip out some of their endless chardonnay plantings and plant more sauvignon blanc. These are the most exciting varietal white wines being made here, bar none. 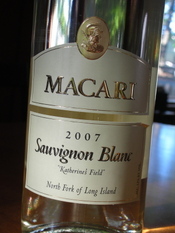 Macari Vineyards, a winery in Mattituck that somehow remains just off of many peoples' radar, has made deliciously fresh sauvignon for many years, and their 2007 vintage may be the best yet. It pours an extremely pale greenish-yellow in the glass and offers intense aromas of grapefruit, lemon and lime zest with understated hints of just-cut grass and crushed Thai basil leaves. The palate is mouthwatering crisp and similarly citrusy, with fresh grapefruit and sweet lime flavors accented by a seawater minerality and more of that grassy-herbal character -- but not too much. The balance between flavor, texture and lively acidity is impressive and the finish lingers nicely. If you want to discuss this wine in terms of global style, I'd say that it lives somewhere between Sancerre and New Zealand. Or you could just say that it's Long Island, which is what I prefer. At some point, we need to start talking about Long Island style instead of always comparing wines with other regions. What's wrong with being unique? It's not every day that I have something as exciting to announce as I do today. 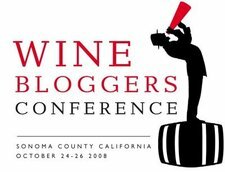 So, without further adieu, I'm happy and proud to announce that wine bloggers from across the country (maybe the world), will be descending upon Sonoma County, CA on October 24, 2008 for a three day conference, the first conference of its kind. It's the Wine Bloggers Conference 2008. There will be speakers like Gary Vaynerchuk and Alice Feiring, vineyard walks, tasting competitions and wine dinners. There will also be an informal (or maybe even a formal) New York wine tasting if I can get a handful of NY vintners to sign on with me. Yes, that obviously means that I'm going to be flying out for it. It's going to be amazing finally meeting many of the bloggers that I already count as friends through virtual interaction over the four-plus years of LENNDEVOURS' existence. My flight is booked. I've reserved a room at a fellow blogger's house and I can't wait for October to arrive. In the meantime, check out the full press release behind the click. And, if you're a New York winery interested in sending some wines along with me, just let me know. Something tells me that some cool-climate wines will be very welcome after a couple nights drinkin Somoma wines. I was working on a post about Finger Lakes wine late on Wednesday night, but then my wife decided it was time to go into labor! Our little daughter, Elizabeth Delia Feulner, was born Thursday morning at 6 lbs. 10-1/2 oz. She was 4 weeks early but seems to be doing just fine. My wife, Katie, is beaming and is recovering well. We are very excited and I'm sure I'll be all the more inspired to drink good wine in celebration--especially when she's a teenager! I heard about this documentary just the other day. It's definitely worth checking out. Now I can start working to get them to come to Long Island, which would be fun, no? 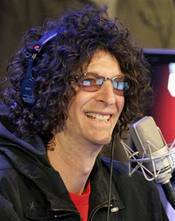 I'm a Howard Stern fan and have been for years. I think I was just finishing high school when I heard him for the first time. And, Nena bought me a Sirius radio just so I could listen every day. Of course, now that Jackson repeats much of what he hears, I don't listen as often on the way into work (because he comes here with me for school). But, I can listen to the replay on my way home, so I can still keep up with what's going on on the show. Wait, how the heck is this wine related? Well, it turns out that Howard was talking about going to an event at the Friar's Club in Manhattan on Monday night, and event where Michael Lynne was pouring wines from his Long Island winery, Bedell Cellars. Of course anyone who knows anything about Howard knows that he complains incessantly about having to go to any sort of function like this, but he did say that Bedell's "champagne" was very good. Didn't know that Bedell makes a sparkling wine? Well, it hasn't been released yet, but it's a blanc de blancs and is named B3 (Bedell Blanc de Blancs). Hopefully I'll get to taste it soon and give you a full report. For now, I guess you can take Howard's word for it. Or not. When I heard about the new venture, I thought to myself "Why just rose? They could probably make a lot more money with red wines." But when I asked him why he's not making red wines, Mr. Croteau told me in an email " Everyone else is doing it... why compete? We make beach/pool/summer wine. We are one of the few wine regions on the ocean. I surf, windsurf (and) hang out at Sunset Beach, and don't collect wine. Make it fun, and good.... let everyone else do 'serious.'" And while the attitude might be less than serious, these aren't wines made using sugary sweet California white zinfandel as the model. Instead, these are dry, classy roses that really show what can be done when rose is made on purpose, rather than as an afterthought. Each of the three roses, again made 100% estate-grown merlot grapes, is made using a single clone of merlot. They retail for $20 per bottle. 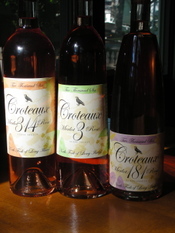 My favorite of the three is the Croteaux 2006 Merlot 314 Rose ($20), which is made using another clone from the Bordeaux region. More overtly fruity, the nose offers a mélange of peach, mango, juicy pear and tangerine. Light-to-medium bodied, the 314 is fruity, but balanced. I can say without reservation that Croteaux's 2006 Merlot 3 Rose ($20) is unlike any rose I've ever tasted. Made using a clone from the University of California - Davis, this rose is barrel fermented unlike the other two, which are reared in stainless steel, and malolactic fermentation brings its own unique magic to the wine as well. Their tasting room is open just south of Main Road on weekends. They expect to release their 2007 trio about a month from now. Stay tuned for tasting notes on those ones as well. My "day job" doesn't involve much travel. In fact, it doesn't really include much of any unless I find a conference or educational opportunity that takes me away from the greater New York City area. 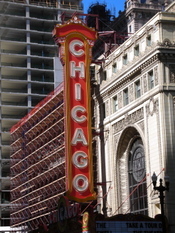 Later this month, I'll be attending one such conference: Web Content 2008 in Chicago, IL. 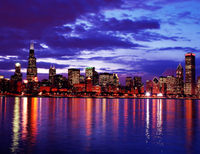 Thing is, I've never been to Chicago, so I'm looking for some recommendations for restaurants, mainly for dinner. I know, I should go to Alinea or Tru. I'm looking into both of those, but I also want to make sure that I get a real feel (and taste) of Chicago. That means steak and deep dish pizza right? So, if you know of any great pizza downtown (I'm staying at the Wyndham and won't have a car) let me know. Any and all recommendations are welcome though, regardless of cuisine.